The TV adaptation of “The Firm” debuted Sunday. Starring Josh Lucas and Molly Parker, “The Firm” debuted on Sunday, and will be moving to its regularly scheduled Thursday night with a brand new episode. Are you a fan of the film version of “The Firm?” How about the book? Not sure if you should get involved in the TV version of “The Firm?” Check out the episode synopsis below and judge for yourself! IT’S GOOD TO BE FREE – TWO-HOUR SERIES PREMIERE – After young lawyer Mitchell McDeere (Josh Lucas, “J. Edgar”) exposed the law firm he worked for was a front for the Chicago mob, he and his family found themselves in the Federal Witness Protection Program. Now, a decade later, McDeere, his wife Abby (Molly Parker, “Deadwood”) and daughter Claire (Natasha Calis, “The Possession”), begin their efforts to reclaim their lives, which proves to be an uphill battle. Also starring Juliette Lewis (“Cape Fear”) and Callum Keith Rennie (“The Killing”). Tricia Helfer (“Battlestar Galactica”) and Shaun Majumder (“Detroit 1-8-7”) guest star. Sound good? Get ready for Thursday’s epsiode of “The Firm” with the following synopsis. 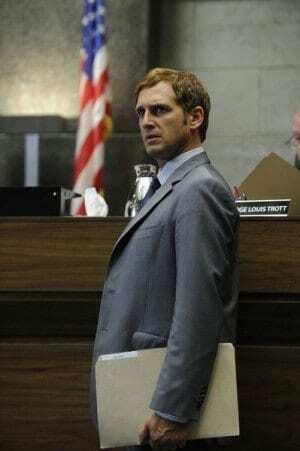 BEING A TEAM PLAYER –Now associated with the Kinross & Clark law firm, Mitch (Josh Lucas) is forced to defend a partners’ son on a murder charge. Unhappy with his new case assignment, Mitch puts Ray (Callum Keith Rennie) to work by having him investigate what really happened. All the while, Mitch starts working on the Sarah Holt (guest star Alex Paxton-Beesley) case and Kinross & Grant’s reason to bring Mitch into the fold is slowly starting to surface. Juliette Lewis, Molly Parker and Natasha Calis star. Tricia Helfer and Shaun Majumder guest star. “The Firm” airs Thursday nights on NBC (10-11 p.m. ET).